Helen Rumbelow recently wrote an article about Radical Candor. I really enjoyed talking with Helen, and was so happy that she immediately understood the difference between Radical Candor and Obnoxious Aggression. Reading Helen’s article, I also realized that I haven’t talked nearly enough about what to do when you disagree with feedback you get. By not explaining this clearly enough, I have given Helen the impression that pretty much all you can do when you get feedback is to say thank you — or as she put it with great good humor, “Thank you, sir, can I have another.” By the end of the article, she does say she’s found a way to say thank you and mean it. But her words make me realize that in general, I talk too much about giving feedback, and too little about getting it. I was worried I gave Helen the idea that the only reply to criticism is to say thank you, that she wasn’t “allowed” to say so if she disagreed with it. 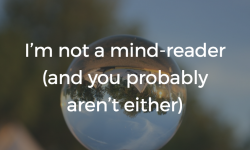 One of the hardest things about getting feedback is not to react defensively. Defensiveness in the face of criticism a perfectly natural response, and we should forgive ourselves and others for having it. 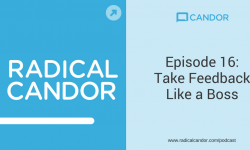 At Candor, Inc. we emphasize that when soliciting criticism it’s helpful to “listen with the intent to understand, not to respond.” This helps reduce your defensive reaction, and gives you the information you need to decide whether or not you agree with the feedback. The next step we recommend is “rewarding the candor,” but we haven’t talked a lot about how to do that if you disagree with the feedback.“Rewarding the candor” does NOT mean just taking it. Sometimes you WILL disagree with feedback. In that moment, just listen and understand… disagree later. It’s almost impossible to disagree without sounding defensive if you disagree too quickly. But, you can and should tell the person that you disagree. If you just say, “Thank you for the feedback” through gritted teeth, you seem Manipulatively Insincere. Better to take the time to explain why you disagree. Once, a CEO to whom I’d offered criticism told me the next day, “I reject that feedback — but I love that you told me what you think! Do you want to hear why I disagree?” Of course I did — and I actually felt better about my coaching of him after that because he’d been so totally open to criticism before that moment that I wondered if he was really hearing it. Rewarding the Candor does not mean just taking it. It’s about showing that you are grateful to the person for being willing to criticize you. Sometimes you are going to get some feedback you disagree with. You don’t want to be defensive. But nor do you want to feel muzzled. If you use Radical Candor — if you state your position in a way that challenges directly and shows you care personally — both you and the person who gave you feedback will be able to come away from the conversation feeling you heard their feedback, were grateful for it, and were considerate, not defensive, in the way you explained your point of view. Repeat back what you think you heard, and say, “Did I understand correctly?” or “Did I get that right?” This is a good opportunity to show you care about the person, and what they think. Ideally, in the moment, just focus on listening and understanding. If you disagree, ask for some time to think more about the feedback. Taking more time will also help if you are mad or feel like it will be hard not to get defensive in the moment. Even if you don’t agree with everything that was said, find some aspect that you do agree with, and share it with the person. Let the person know what you don’t agree with and why. Ask to discuss both your thinking and theirs. This is where you need to employ both your “challenge directly” and your “care personally” skills. Commit to a course of action. One thing that can help you react with Radical Candor is to think about criticism as a gift. If somebody gave you a shirt that was the wrong size, you’d say thank you because they cared enough to buy you a gift. But you wouldn’t have to wear the shirt in the wrong size just because someone gave it to you. If the shirt came from a person who’s going to give you more gifts in the future, you might tell that person what your shirt size is, or risk a lot more shirts in the wrong size. 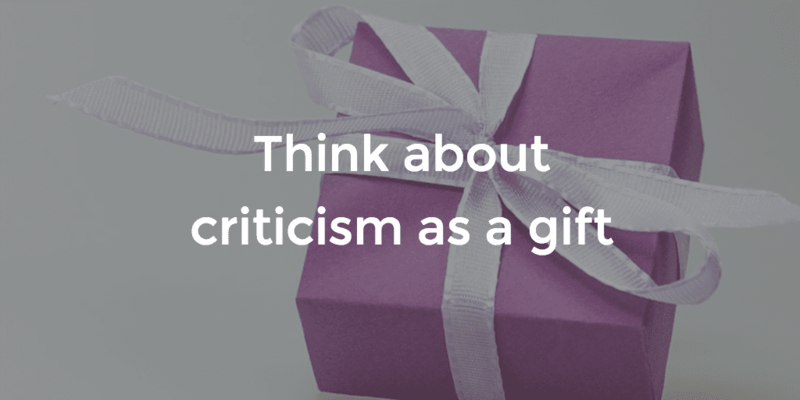 Think of criticism as a very specific kind of gift. There are two ways in which it can be a gift. The person can be pointing out a problem that, now you’re aware of it, you can fix. OR, the person can be pointing out a problem that is not actually a problem. Now that you are aware of what they think, you can give them an alternative point of view and perhaps change their mind. If you never disagree with criticism, then you’re not taking full advantage of the gift. When criticism is offered in good faith, it’s a gift. It may not be the gift you wanted, or even the gift you needed, but the very act of giving it is an act of caring. We have found from personal experience and from clients that thinking about criticism in these terms often proves useful in developing the skill of receiving it.